The decade started with the biggest crisis in the band so far, one that came close to end the band for good. But thanks to 'caretaker' Peter Knight and the formation of a 'classic line up' including Maddy, by the end of the decade the Band had enjoyed its busiest period since the 70's with the longest running line- up the band had ever known. There were 6 studio albums, 2 Live albums with DVD's, various global Tours to America, Australia and Europe and a 'Folk Tradition' award at the BBC Radio 2 Folk Awards. 2nd: Ludlow festival. Dave Mattacks joined the band on drums. Prickly Bush; Old Turf Fire; Black Jack Davy; Dark Eyed Sailor; The Stuttering Lovers; Bonny Birdy; Water is Wide I wish I was Never Wed; Well Don Liar; Thomas the Rhymer; Old Maid in the Garratt; All Around my Hat/Jigs. 3rd: Nettlebed Folk Club, Oxford. Dave Mattacks on drums. I assume this is Bob's last concert. Bob Johnson announces he will leave the band after finishing the next album. No statement by Bob giving reasons for his leaving but one band member said that it was due to 'Personality Differences'. Rick Kemp (Bass) announced as replacement for Bob on the tour, with Tim Harries moving across to guitar. Rick did not become a full member of the band until the reunion in 2002. Dave Mattacks on Drums, Rick on Bass. Prickly Bush; Old Turf Fire; Who told the Butcher or One True Love; Dark Eyed Sailor; John of Ditchford; Hawkstow Grange; Erin; [Interval]; Staring Robin; Bonny Birdy; The Water Is Wide; Wish That I Never Was Wed; Thomas The Rhymer; Old Maid In The Garrett; All Around my Hat; Jigs and Reels. 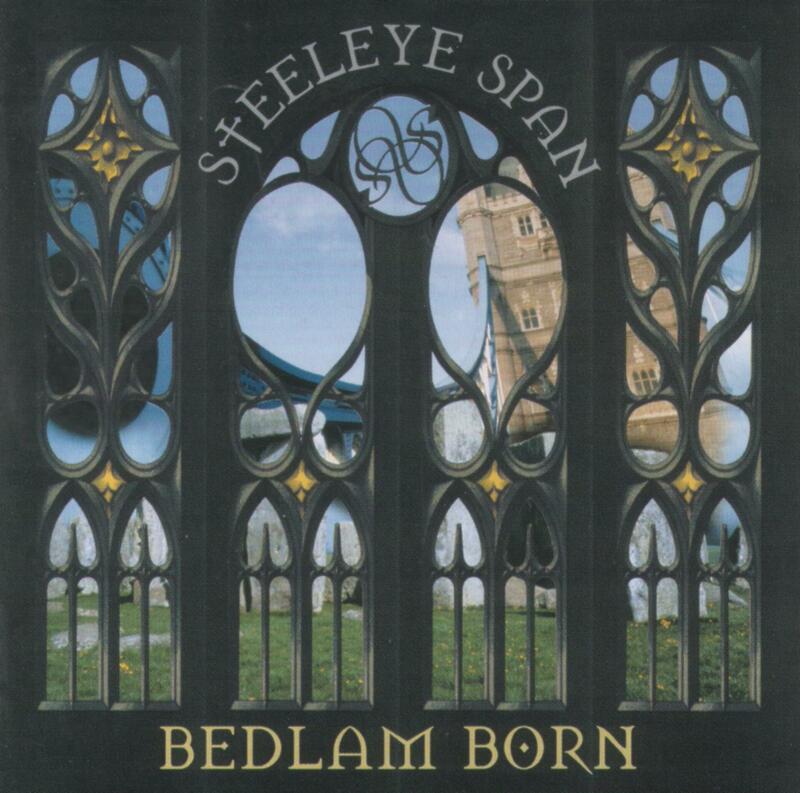 25th Sept: Eighteenth ALBUM: Bedlam Born (Park Records). A significant change in direction after Horkstow Grange. The two albums are effectively opposites with this one having more emphasis on the rock element of Folk Rock, although still a mainly Trad. Arr. set of songs. It was also however a very strained album with Bob effectively announcing in the liner notes that he was leaving the band. He recorded most of his parts on his own and did not get very involved with the recording by all accounts. During the recording sessions for Bedlam Born the band recorded a Tim Harries song called 'Staring Robin' which had been popular live. Park Records recommended that the track was not included as it was closer to 'Punk Folk' and would detract from the rest of the album. Peter Knight has since said he felt that this was an incorrect decision (by the band to follow the recommendation). I have have a poor quality bootleg that I recorded myself, (video below, audio only) which I believe is the only known live recording of it, and is interesting to listen to purely from an historical perspective. Autumn UK 'Bedlam Born' Tour (23 dates). I heard 'There was a Wealthy Merchant' played on this tour but I don't think it was played often. The 'Hat' song was dropped a few times in this period. With Bob having left it impacted how many new album tracks were played, although Rick's return did mean the return of 'Robbery with Violins' . The band continued to play Starting Robin and Stuttering Lovers despite neither making the grade for the album. Not exact order: Horkstow Grange; John of Ditchford; Who Told the Butcher; Prickly Bush; Bonny Birdy; I see his Blood upon the Rose; Robbery with Violins; Stuttering Lovers; Beyond the Dreaming Place; Staring Robin; Thomas the Rhymer; White Cliffs of Dover; encore: All Around My Hat; The Masons Apron. 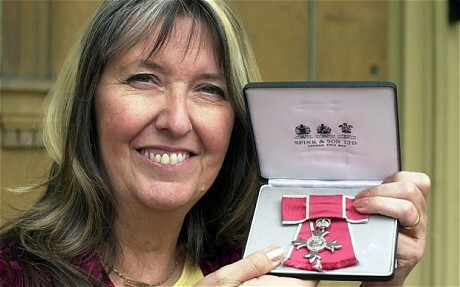 2001: Maddy Prior became a Member of the Most Excellent Order of the British Empire (MBE) for services to Traditional Music. Gay Woods leaves the Band. around Band royalties. Her statement was: "I will say that after the tour I'm afraid my dealings with the whole situation were not very nice so I decided it would be, for health reasons,....better just to leave it. So I'm just myself now "
"As the last man standing, the future of Steeleye did rest with me and for a long time I wasn’t really sure what to do about it. The Band had been around for over thirty years and to be honest, that seemed as though it should be enough and time to call it a day anyway. So no, at that point I wasn’t confident about its survival and there were moments when I really didn’t want the Band to reform." 19th Peter Knight and Tim Harries (the remaining full time members, as Rick Kemp had just joined for the last tour) make a joint statement that they will continue to work on new material and see where the music takes them before making a decision on new members later in the year. Peter: "I am pleased to tell you that Tim and I have decided to work together and reform the band. This will be both exciting and challenging. We will be performing at Cromer on May 13th as planned and the line-up will include Rick Kemp on Bass. I will keep you informed of any developments. Thanks so much for all the email and for your continued support. Forever Forward. Peter." Tim: "Thanks to everyone who's shown us the kind of genuine support we have grown to really appreciate. 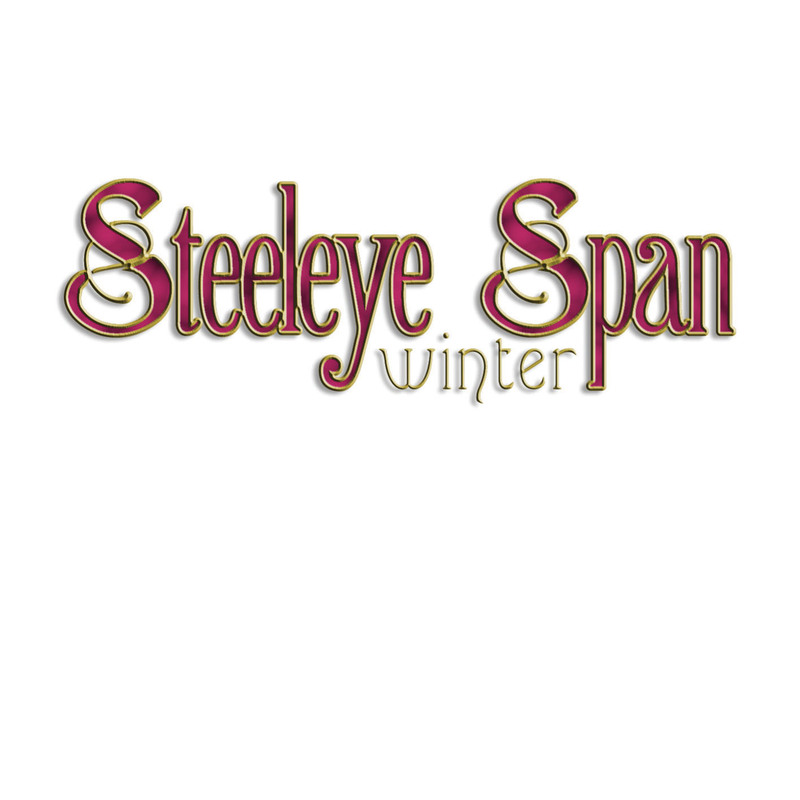 Once again awash with change, we've put our heads together and that's where they're going to stay, co-writing and demoing a new STEELEYE SPAN Album that we intend to have ready to record by the end of this year. All potential future Line-up decisions will be based on combining this new work with vintage Steeleye in the most volatile mix possible. After that we will saddle up and storm the gates in a clatter of rockin' bones"
19th: Tim Harries leaves the Band. A new low as Peter Knight is the only remaining member. His statement was "Tim Harries has had a change of heart and has decided not to battle on against the odds. I don't feel at present that I want to reform the band alone, but I will live with it for a while before making a final decision." Peter Knight indicated on his website that he was in discussions with Park Records/John Dagnell about the future of the band, and that it was looking promising. 6th: Peter Knight confirms that the band will continue, with a new line up in the new year. No news until then. 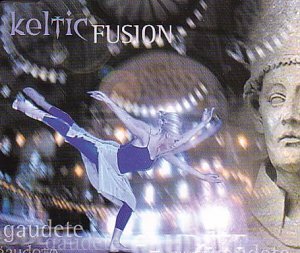 'Keltic Fusion' (Maddy Prior, Troy Donockley, Nick Holland, Rose Kemp, Jacqui McShee) Single: 'Gaudete/Greenwood Side' (Park Records). Peter Knight says on his website that there are delays to announcing the new line up, due to, in his words: "I can't give you a positive answer to your Steeleye question. With no prior warning, and no pun intended, Park Records released another version of Gaudete by Maddy and her 'friends' which has created a variety of reactions and a conflict of interests. We have decided to wait for the dust to settle and talk again next year. Very unfortunate." March 2002 NEW 'CLASSIC LINE UP' ANNOUNCED. 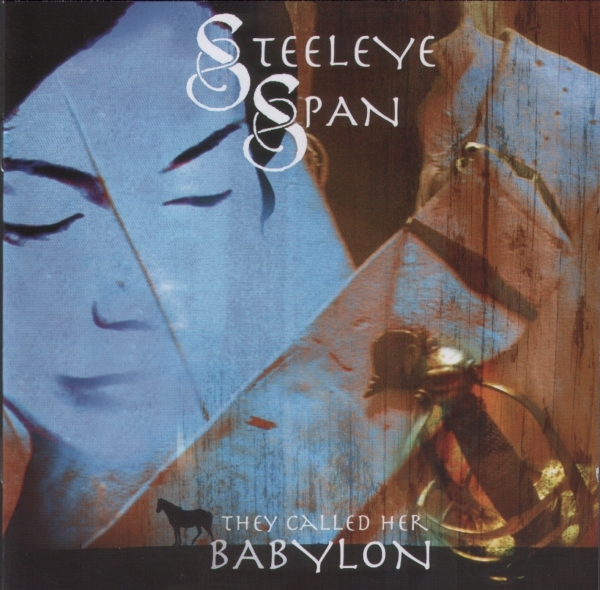 8th: Peter Knight Statement "There are plans to reform a classic Steeleye Span line-up. Talks have been going on for several months between myself and Park Records, Maddy Prior, Bob Johnson, Rick Kemp and Liam Genockey. We were hoping to tour later this year but due to unforseen circumstances this is now looking unlikely. 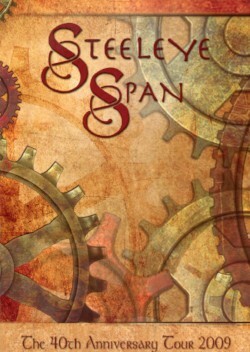 I shall now concentrate on my solo work and remain optimistic that we will see Steeleye Span on tour next year." 10th: A new statement from Peter that the Band will now tour in 2002 and release a new studio album that will consist of re-recordings of the classic Steeleye songs voted by fans in an online poll on the Park Records Website. On a personal note I would like to say that I am delighted that this has all come together at last, and I am looking forward to playing with, and hearing this great line-up. I will keep you informed of all developments. A huge thanks to all of you for your wonderful support, patience and optimism. An important studio album reflecting the 're-setting' of the band with its new 'classic' line up and the return of Maddy Prior. (Probably helped with the re-setting of royalties as well!) It is made up of re-recorded classics, in part voted by the public in an online poll by Park Records. It included the 'Lyke Wake Dirge' for the first time, it was a standard concert opener in the mid 70's; re-workings of 'When I was on Horseback' & 'Hard Times of Old England'; The 'as intended' verses of 'Let Her Go Down'; A bonus track - an A Capella version of 'Rosebud in June' (after King Henry). The collection of songs formed the basis of the live set for the next couple of years. As mentioned above, the track listing was meant to be chosen mainly by visitors to Park Records. 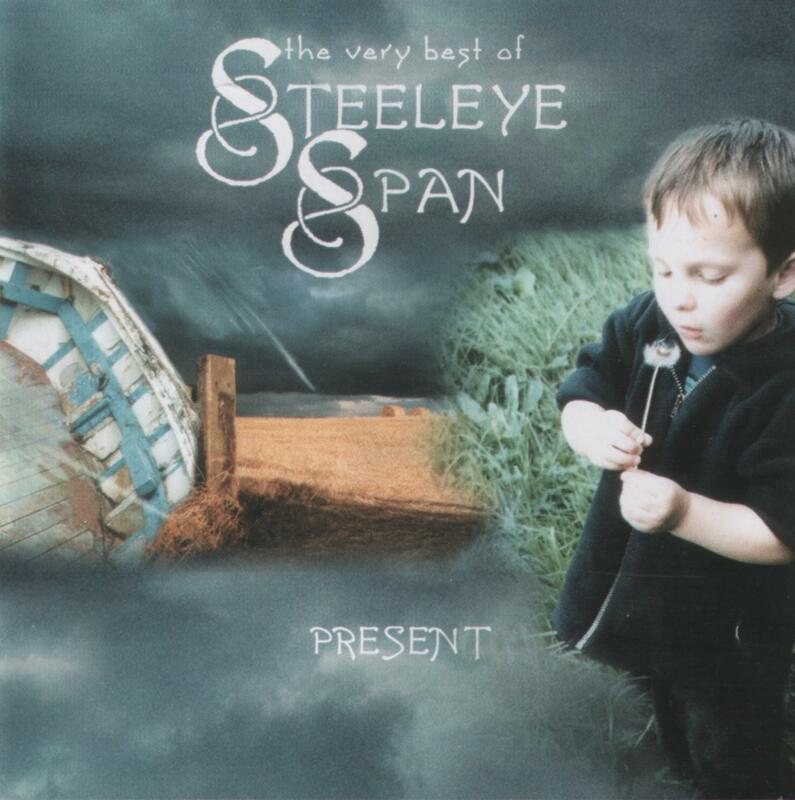 who were asked to vote for their favourite all time Steeleye tracks. However, as you can see from the results below, the band/Record Company took a significant 'artistic license' with the results! 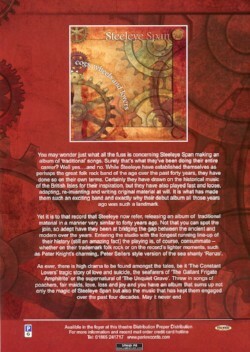 To be fair the wording they used was: "In recognition of the loyal support of their fans Steeleye will be looking very closely at the results of the online poll of fan’s all-time favourite tracks when selecting material for the album". Perfectly understandable of course that the Band can record whatever they see fit, and the additions they made themselves were great, but personally I think they missed some great tracks! I have highlighted the ones from the list not recorded. Bob Johnston Leaves the Band. Ken Nicol joins the Band. Ken replaces Bob after Rick Kemp had seen him perform at a solo gig back in August. Ken had previously been part of the Albion Band. Ken joined initially for the tour but everything went well so he joined the band full time after the tour. Winter UK 'Reunion' Tour (17 dates). Ken Nicol kept a diary of the tour and recorded the attendances, which I have included below. Rose Kemp joined the band for the tour and sang Backing Vocals on some of the songs towards the end of the 2nd set. The set list was taken completely from 'Present', which would make sense with Ken joining just before the tour. 30th The Queens Head' Icklesham, Sussex. 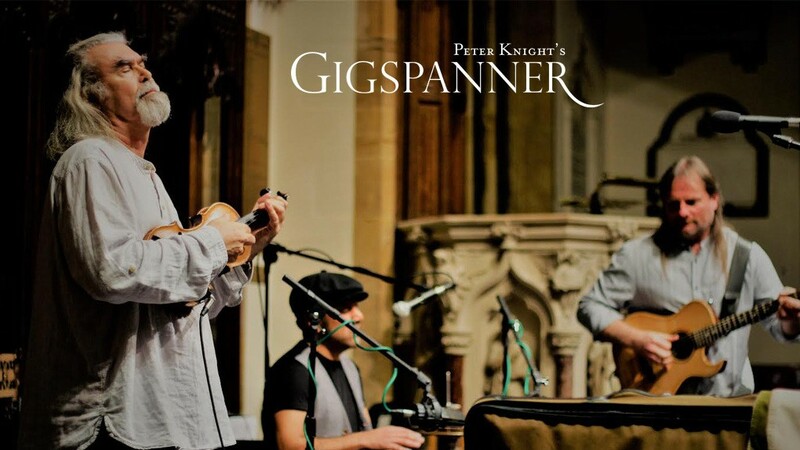 Debut of Peter Knights new trio as 'Gigspanner'. Now called 'Peter Knight's Gigspanner'. 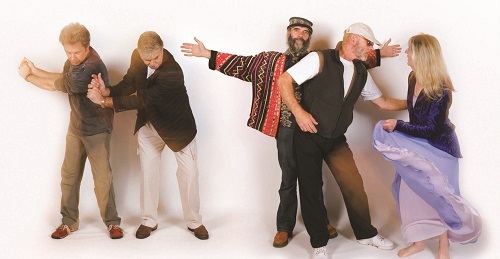 The band starting touring and recording seriously in 2008, and become Peter's main focus when he finally decided to call it a day with Steeleye in 2013. Click on the picture below. 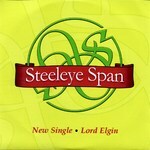 The band has released a number of albums and tour regularly, with always a good measure of Steeleye songs in the mix. With 71 dates the busiest year since the 70's. The 35th Anniversary year with a tour of Australia and two new studio albums! Australia/NZ Tour (14 dates) Support: Ralph McTell. A Calling On Song or The King; One Misty Moisty Morning; Samain; Sir James the Rose; Let Her go Down; Two Magicians; Cam Ye or Blackleg Miner (or neither); Betsy Bell; Drink Down the Moon/ They Called Her Babylon; Si Begh Si Mohr; Long Lankin or When I was on Horseback; Thomas the Rhymer; Encore: All Around My Hat; Gaudete; Tunes. 2nd TV: Interview and a live singing of 'The King' for Channel 9 'Kerrie Ann Morning Show'. Aired 4th. 3rd Two Live Performances and interviews for 'Angel Catterns' and ABC Canberra. 17th The Basement, Sydney. Impromptu performance at a small club. The first album of completely new material from this new line up and since the return of Maddy Prior. A strong mix of traditional and original tracks including the title track by new boy Ken Nicol. 1. Van Diemen’s Land 2. Samain 3. Heir of Linne 4. Bride’s Farewell 5. 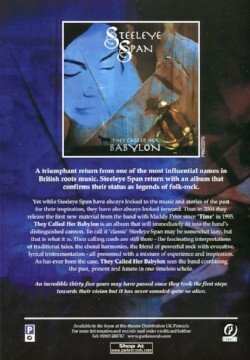 They Called Her Babylon 6. Mantle of Green 7. Bede’s Death Song 8. Diversus And Lazarus 9. Si Begh Si Mohr 10. Child Owlet 11. What’sThe Life Of A Man? Surprisingly only 5 tracks from the new album made it to the setlist and most of those had been seen on the previous tour. A significant amount of songs from 'Present' are still played but Prince Charlie Stuart and 4 Nights Drunk make a return to the live shows, prince Charlie was played at the Journey concert and 4 Nights Drunk did appear in the 80's occasionally. King Henry (dropped in tour); Padstow, replaced by King Henry from 4th; Prince Charlie Stuart; Four Nights Drunk; Who Told the Butcher; Mantle Of Green; Long Lankin; Samain; All Around My Hat; Interval; Tam Lin; Let her Go Down; Liam's Drum Solo; Drink Down the Moon; Si Begh Si Mohr (dropped & brought back); Betsy Bell and Mary Gray; They Called Her Babylon; The Blackleg Miner; Sir James the Rose; Van Diemen's Land; Encore: Cam Ye or Thomas the Rhymer Or Padtow in May! ; Gaudete. 16th Cambridge Corn Exchange, Cambridge, 1,400 virtually full house. 17th King Georges Hall, Blackburn. 23rd Roskilde near Copenhagen, Open Air. 25th T.B.C. did anything happen? 1st Sidmouth Folk Festival. 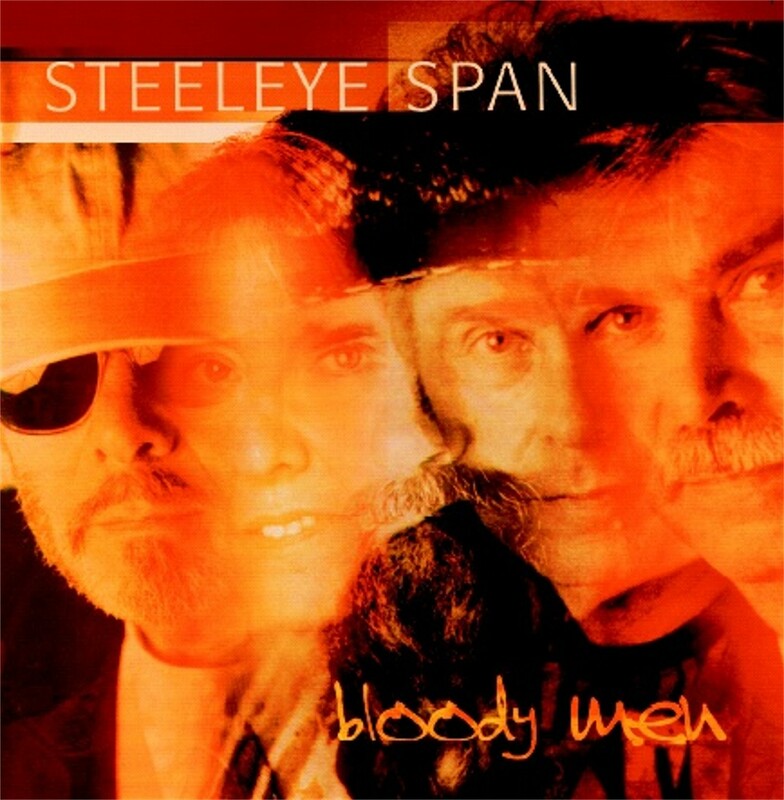 There was a programme on BBC4 on 27th August which celebrated 50 years of this Folk Festival and the listing included Steeleye Span but it is not known exactly what was shown but from the reviews - not much Steeleye! Twenty First ALBUM: WINTER (Park Records). The 2nd Studio album of the year and a collection of seasonal songs (rather than a 'Christmas' album per se) . A mixture of traditional songs/carols and original compositions, mainly by Ken. Winter UK '35th Anniversary' Tour. Unsurprisingly the set list features songs from the new album as songs from 'Present' slowly get dropped. 'London' is played for the first time since 1976 and Cold Haily Night, for the first time since 1971, apart from the Journey concert in '95. The latter will make the next album in 2 years time. 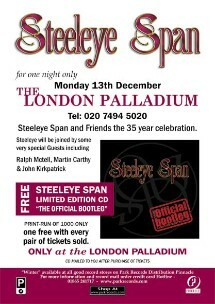 13th London Palladium, London. 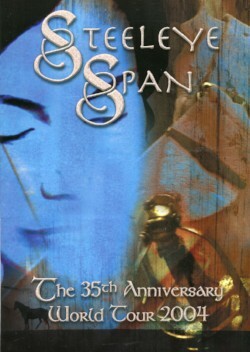 Special '35th Anniv' concert. W. Martin Carthy/Ralph McTell/Tim Harries. Given 'Official bootleg' CD if attended. The line up was meant to include John Kirkpatrick but he fell over in the hotel and had to go to Hospital, Tim Harries stepped in on String Bass. Extra songs: I Live not Where I love & Dancing at Whitsun for this concert, and had Ralph sing 'Streets of London' as the first encore. 14th City Hall, Salisbury 900 full house. First Nowell becomes first Encore. 15th Town Hall, Cheltenham. Full house. 19th Warwick Arts Centre, Coventry. Full House 1,200. TV/Radio: Steeleye Span receive the 'Good Tradition' award at the Radio 2 Folk Awards and perform Van Diemens Land at the show. Big Changes after a year away with the 'Winter' songs get dropped replaced with new songs from the upcoming new album, including Bonny Black Hare as the opener which eventually becomes the big set closer for many years. Introduced are two song that will only appear on a live album: 'Who's the Fool now' and 'I live not where I love', the latter last played live in the 80's. Bonny Black Hare; Cold Haily, Windy Night; Who Told the Butcher; Who's the Fool now; I live not where I love; Hard Times of Old England; The Scullion King; Seagull; Van Diemen's Land; [interval]; Saucy Sailor; Padstow; Lord Gregory; Nedd Ludd; Demon of the Well; Lord Elgin; Last House in Connought/The Lady of the House. Encore: All Around My Hat; Gaudete. 28th The Palace Theatre, Mansfield. 30th The Corn Exchange, Cambridge. 1st May The Alexandra Theatre, Birmingham. 3rd The Assembley Hall Theatre, Tunbridge Wells. 4th The White Rock Theatre, Hastings. 5th The Roses Theatre, Tewkesbury. 6th The Roses Theatre, Tewkesbury. 7th The Philharmonic Hall, Liverpool. 9th Martlets Hall, Burgess Hill. 12th The Playhouse Theatre, Weston-Super-Mare. 14th The Grand Hall, Dorking. 15th St Georges Hall, Exeter. 16th Hall For Cornwall, Truro. 21st The Lawrence Batley Theatre, Huddersfield. 23rd The City Varieties Music Hall, Leeds. 24th The Beck Theatre, Hayes. 25th The Medina Theatre, Newport, Isle-of-White. 26th The Theatre Royal, Winchester. 28th The New Theatre, Oxford. Bonny Black Hare; Cold Haily, Windy Night; Who Told the Butcher; Who's the Fool now; I live not where I love; The Scullion King; Long Lankin; Seagull; Van Diemen's Land; [interval]; Padstow; Lord Gregory; Nedd Ludd; Demon of the Well; Lord Elgin; Last House in Connought/The Lady of the House; Tam Lin; Hard Times of England; Encore: All Around My Hat; Gaudete. Italy dates. Did they actually happen? The first studio album cover to feature the band on the cover since All Around My Hat and to be honest you can see why, it doesn't really work. The album was a 50:50 split of original and traditional recordings with Rick's 5 part 'Ned Ludd' set of songs on CD2. Cold Haily Windy Night gets another studio outing as do the tunes from Tempted and Tried. Written by Peter Knight. The live version was also available for free as a download at some point. Released to help promote Spanfest. The festival was well run and fairly well attended, I can't recall if it was professionally recorded but there was certainly footage being taken around the festival and there was some clips available from Park Records for a short time afterwards (and as a promo for the following years running - video below). There are also some limited audience recordings on youtube which give a flavour of the setup. The event was run at a loss however which meant the following years was not held at Kentwell Hall, as originally planned. See below. Van Diemen's Land; Prince Charlie Stuart; Si Bheg Si Mhor; '1st House' reels; Cold Haily Windy Night; Seagull; Let Her Go Down; London; Who's the Fool Now; Who Told the Butcher? ; They Called Her Babylon; 3 Sisters; Lord Elgin Tam Lin; Betsy Bell and Mary Gray; Bonny Black Hare; Hard Times of Old England; Hat; Tunes. 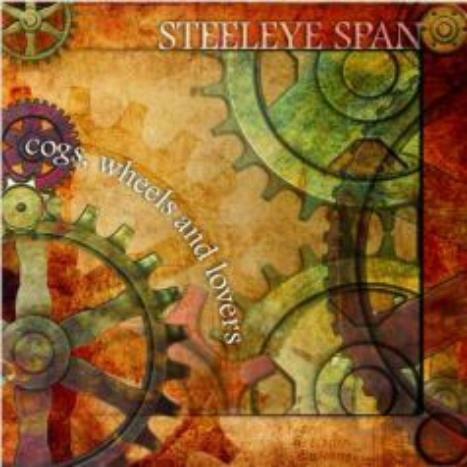 3rd: Steeleye Span is a specialist subject on BBC TV Mastermind for Stewart Cross who went on to the Grand Final. 24th Nettlebed. SpanFest warm up gig. 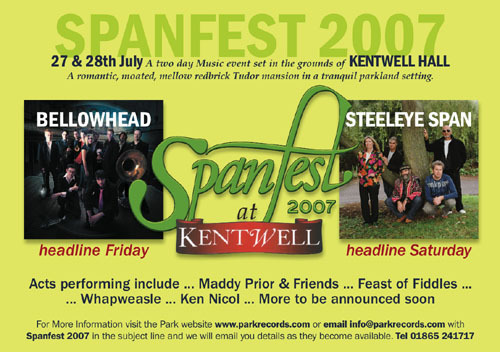 The second but sadly final running of SpanFest. This time at Stanford Hall. 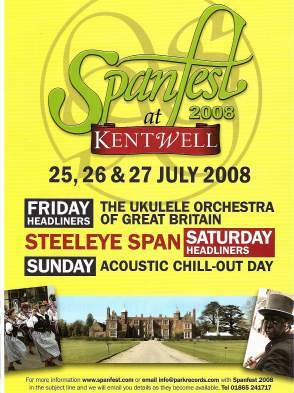 Initially it was advertised as a 3 day festival at Kentwell Hall (picture below) , but it was reduced down to one day and moved to Standford Hall (announced 18th April). Leicestershire. Probably moved due to low ticket sales in the first year, although ,Maddy said it was because of a "confusion" (?). 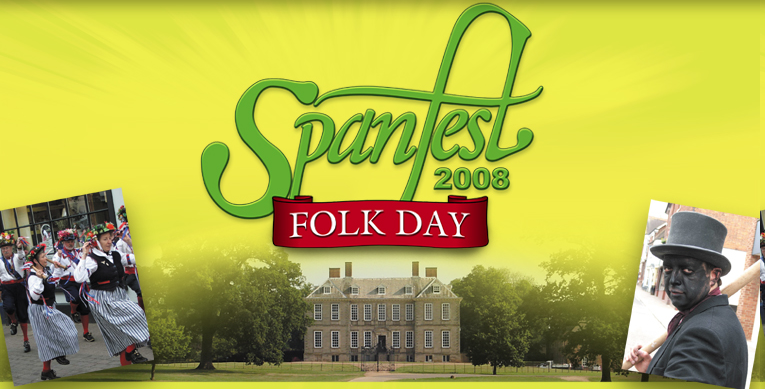 The general view is that Kentwell Hall is privately owned and hosting festivals was just not something they felt comfortable with. They also confirmed that they lost money and assurances they needed to avoid a loss this time around from Park Records were not forthcoming, and so a repeat in terms of numbers was probably not attractive. The venue has not since hosted any concert/festival. Other acts included The Ukulele Orchestra of Great Britain, Whapweasel and Maddy Prior alongside Steeleye. The day went well considering it was not widely advertised (as usual) and there was an estimated 800-1,000 sized crowd. And the beer didn't run out this time. 18th August: SINGLE (Never released): Hard Times of Old England. The (Digital Download] single that never got released. Promo CD below. Studio version of the 'Rock 'n Roll' version that the band were playing at the time. Quite short with verses taken out. Maddy appeared with daughter Rose Kemp and friends & collaborators June Tabor and Tim Hart. John Kirkpatrick also played. Further videos on Youtube and one with Tim is at the bottom of this page. 21st: BBC4 TV 'Steeleye Span night'. 'Electric Folk' episode from 1974. Showed 'Maddy Prior at the Electric Proms' - 1st aired on 24th October. The first showing of an episode from the 1975 series 'Steeleye Span: Electric Folk' This was the one from Penshurt Place, Kent. Video is on the 1974 section. The show followed 'Maddy Prior at the Electric Proms' - 1st aired on 24th October. A busy end to the decade with it being the 40th Anniversary year. 2 UK Tours, an Australian and a US tour plus of course a new Studio Album. Pete Zorn joined the Band on tour as Rick Kemp was ill. Tim Harries was approached but could not make all the dates. Pete had two weeks to learn all the songs. 26-29th Rehearsing for new album at Parlour Studio, Kettering. 'Decision to largely avoid personal compositions' A decision that Ken had "a degree of disappointment" to doing, in his own words. Recording new album at Propagation Studios, North Tamerton. Joe Partridge arrived to potentially produce the album but contract negotiations etc broke down. 22nd Live Session at Sirius XM, Sirius DC. One hour Live Set. 29th A.B.C Radio Show. Performed Ranzo. 30th "Event Centre" Southern Cross Club, Canberra, Australia. The 6th studio album of the decade! After a tendency towards a mix of traditional and original songs for the last few albums. this one is rooted 100% in the traditional. At rehearsals the band decided to focus on traditional songs and not the original compositions brought forward for consideration. The arrangements are mainly by Peter and Maddy as Rick was not well and Ken's original contributions were not used. Ken did express some dissatisfaction at the focus away from original songs. Rick Kemp back to Tour. However, during the tour Rick was feeling unwell so it was arranged that Pete Zorn would join the tour from 22nd November. As it happened Rick was ok so Pete joining made Steeleye a 6 piece for the first time since 1982. Old songs back in the set for the 1st time since the 70's I believe - All things are Quite Silent; SheepCrook & Black Dog (1974 on Electric Folk) and Little Sir Hugh. With set-lists scarce from the 80's I can never be quite sure though when making these pronouncements! In fact, I can see no mention of 'All things are Quite Silent ever being played live..! While Rick also brings back Bachelors Hall for the 1st time since he left in 1986. Tour Set List: Little Sir Hugh; Creeping Jane; Seagull (replaced Who Told the Butcher after 2 nights) ; Bachelor's Hall; Cold Haily Windy Night (added from 1st Dec) Sheep Crook and Black Dog; They Called her Babylon; I live not where I love; Si Begh Si Mohr ; The Gallant Frigate Amphitrite [Interval]; All Things are quite Silent; Ranzo; The Silky of Sules Skerrie; Unconquered Sun; Van Diemens Land; Peace on the Border; Tunes; Bonny Black Hare (not on all the tour); Thomas the Rhymer (dropped after 1st Dec for 'The Three Sisters' when Maddy's voice needed more rest); Encore: All Around My Hat; Hard Times of Old England; Song Will remain . 16th Reading Concert Hall, Reading. 17th The Playhouse Theatre, Weston Super Mare. 18th Exeter Corn Exchange, Exeter. Full House - 500. 19th Salisbury City Hall, Salisbury. 23rd Ipswich Corn Exchange, Ipswich. 26th The Medina Theatre, Newport. 29th The New Theatre, Oxford. 2/3rds Full. Cold, Wet & Miserable. But per Ken a great concert! 1st. Dec.The Stables, Milton Keynes. Full House. 2nd. Dec.The Stables, Milton Keynes. 19th. The Hove Centre, Brighton. 24th December 2009. Tim Hart dies, aged 61, from Cancer. The Guardian Obituary. His last appearance was at Cecil Sharp House in October 2008 with Maddy Prior for the Electric Proms concert on BBC4. Video Below.